The perfect box for your knitting, needlework, games or even holding your fat quarters! 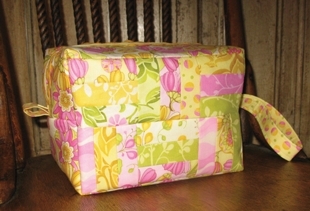 This box is made from 1 pack of 5" charm squares (12 light/medium/dark squares) and 1 fat quarter for the main fabric. Finished size is 6" x 6" x 9".